Edited by Steven Croft and Paula Gooder with contributions by Stephen Cotterel, Viv Faul, Joanna Grenfell, Emma Ineson, Rosalyn Murphy, Ian Paul, Jo Bailey Wells. The issue of Women in leadership is a debate which has raged on for years now. In the Church of England it has come to a head now with the institution of women bishops only one more vote away. The one thing that has been shouted out from both sides of the line has been the need for theological debate and conversation instead of snappy arguments and personal attacks. Whatever side of the debate you are on this book is challenging and eye opening. It can be read and reflected on your own or in a group with helpful prayers to wrap the chapters up. My opinion on the debate puts me on the opposite side to the argument put across in this book, but I have been screaming for a book like this. The one thing that has always frustrated me in debates is people suggest women should be bishops because… But this book seeks to back it with theological/ scriptural evidence. Though I disagree with the conclusion made, it was a refreshing side to the arguement and I recommend that people from both side of the debate should read this book. I do feel it is best to read this on your own, reflect and pray on your own, then go and talk with others who have read it. 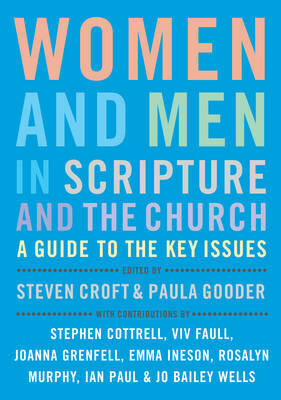 Overall I really took alot from this book and as I said a very refreshing breeze in the debate on women’s ministry.